Pretty awesome looking, I want a 100 rounder just for kicks. 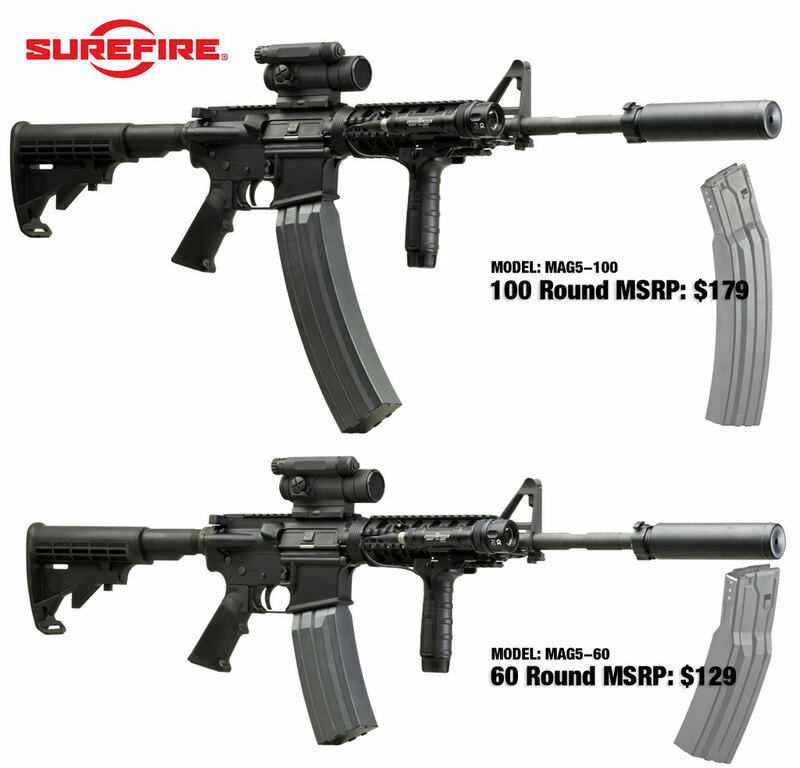 Unfortunately they are not available yet, and there is no mention of them on SureFire’s own website yet either. Seems like a decent idea because the biggest one has the same capacity same as the Beta C-Mag drums, is cheaper, and is in a more compact package with less components. The quad stack magazine isn’t a new idea. There are some pictures of a rare AK version I posted about HERE. I’m aware that there was some whisper a while back of a Magpul quad stack mag as well… Just vapor ware still though for that. Plans have been made and finished, and patent has been processed already that I can tell. Yea that’s just a patent application, which unfortunately doesn’t mean much. I’m sure SureFire has an application of their own filed too. The quad column mags are sometimes referred to as “casket magazines” to distinguish them from single- and double-stack box mags. I had a SITES Spectre pistol back in the mid ’90s that took either 30- or 50-round 4-column mags. Could this be an alternative to beta mags for the Marines’ IARs? Seriously I cannot see IARs going out with 30 round mags and with the reports that beta mags are not the most reliable, these Surefire 60-100 round mags make sense for the IAR mission. Bill, I was thinking the exact same thing as I read this. I suspect that the 100-rounder is just too long and unwieldy, but I could certainly see Marine automatic riflemen demanding the 60-rounders for their IARs. Kind of a “peanut-butter and chocolate” convergence almost seems destined. Saw an article in the Military Times that the IAR is Afghanistan bound (http://www.militarytimes.com/news/2010/12/marine-infantry-automatic-rifle-deploying-to-afghanistan-120610w/) and the units that will be fielding them. I guess just watch for some upcoming pictures of fielded IARs and what mags they’ll use is the final validation. Interesting. I’m concerned about price and weight however. Weight looks like it is distributed more evenly in this sort of design over use of a mag clap however. Being Surefire, I’ve no doubt it will be rugged and reliable. The 100 looks really clumsy. I like the 60rnd model though! Weight would be an issue, but then again 100 rounds weighs the same no matter what you stuff them into. They look really long. I could see the 60 rounder being useful since its around the same size as a 30 rounder, but imagine trying to use the 100 rounder in the prone position. Still it would be a blast to have at the range. At those prices I’m not interested no matter how reliable they are. The price, you should compare that to a drum mag. My thinking is if it’s stupid and it works it’s not stupid. The main questions are, is it reliable, how are the feed lips, is it prone to denting, in essence how much abuse can this mag take before failure. Because if this is what you have and it fails you have a single shot weapon. You could always crack someone over the head with it too! Ouch. A pic Raven Concealment posted to their Facebook page which tagged Travis running a surefire 100rndr… Did they sell the design? I picked up two of the sixty rounders and used them in my kel-tech plr-16. They worked fine except they would not feed the last 4 or 5 rounds. However when I pulled the mag and tapped the rds to the back of the mag they fed fine. This happened to both mags. Maby they should be called 55 round mags?